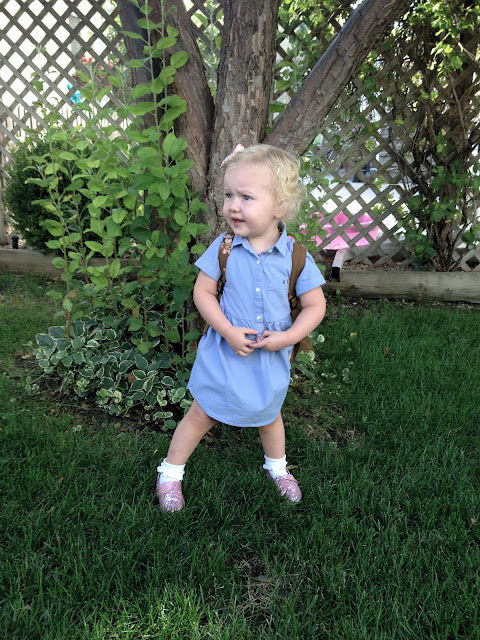 Harper started school earlier this month. When I say school, I use the term very loosely. It is more of a mother's day out / bible school that occurs once a week for half of a day. The children have about 8 classmates and a very sweet and experienced teacher. It is mostly play based, but they attend chapel where they learn songs and have bible lessons. It is really sweet and I was so excited for Harper to get started. Harper has always been with me. We very rarely get a babysitter...like twice a year when our families come in to town. My husband just works like crazy and our budget is tight, so we are just always together. Harper is a very outgoing little girl who always asks me if she can go say, "hi" to the other children when we are out. So, when school started, I didn't know how she would do when it was time for me to go. When I picked her up from school, she was crying. I asked the teacher how it went, and she informed me that there was a lot of crying, but that next week would be better. I asked Harper how her day was and she said, "I sad at school, mama." So, after a lot of talking and play and explaining that I will always be back to pick her up, I hope that next week will be better for her.